Options and modifications to enhance and customize your wine cabinet. Specifically designed to work with Le Cache wine cabinets with "no moldings" using CellarPro cooling units, our front-vent hood and grill allows you to place your cabinet in alcoves, built-in spaces and locations with low ceiling height. The hood also reduces noise from the cooling unit by 3-4 decibels. Our front-vent hood is designed sit atop upright Le Cache wine cabinets and redirects the hot air exhaust to - and intake from - the front of the wine cabinet. No assembly is required. Grills are available in a choice of colors - black (shown), white, silver or brown. 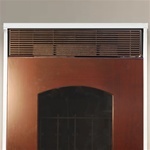 The grill sits just behind the doors, and the width will customized to the width of your wine cabinet. For Le Cache wine cabinets with crown moldings, (ie Euro and Mission wine cabinets) the hood should be purchased WITHOUT the grill. There must be enough room (at least 7 1/2 inches) for the hood to be lifted and removed so that the air filter can be replaced periodically. Allow 3-5 days to release to shipper.